As invigorating as life on two wheels can be, it can also get pretty pricey. We’re talking leather vests, riding chaps, weekend chaps, formal chaps and countless black T-shirts. And that’s an image worth protecting, at any cost. Luckily, it might not cost as much as you think. Our independent insurance agents shop and compare motorcycle insurance policies from multiple companies to find the right coverage at the best possible price. They'll even break down any fancy insurance language into good ol’ plain English as they walk you through the entire process step-by-step. But before we go and get all up in this thing, we want to talk a bit about motorcycle insurance, the coverages you need and, ultimately, how premiums are born. 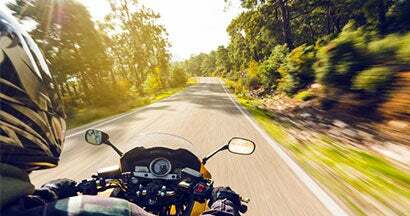 What Is Motorcycle Insurance and Why Do I Need It? 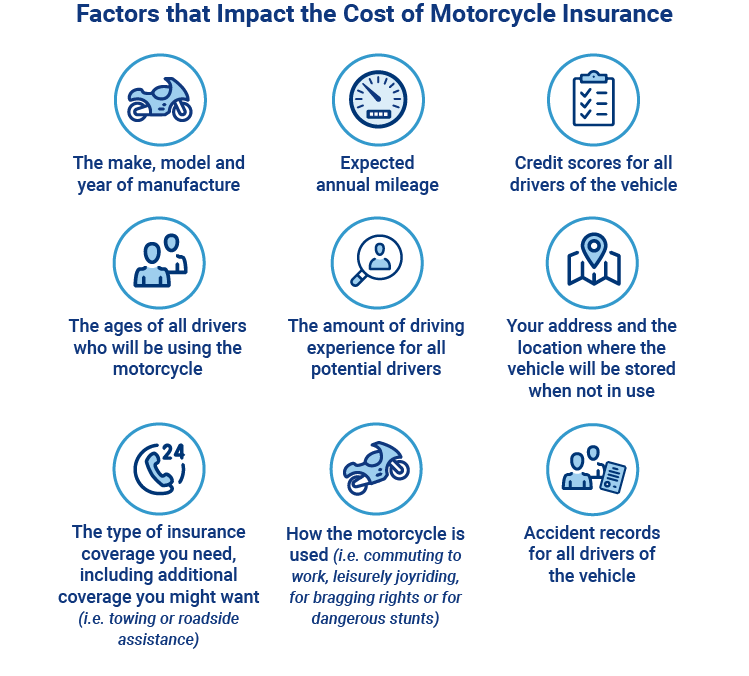 Simply put, motorcycle insurance is a contract between you and the insurance company where you pay them, and they help you out if your ride gets stolen or wrecked in an accident. Your insurance policy helps you get temporary transportation, pay for liability claims and repairs, and a whole lot more. Every state in the union has different laws regarding motorcycle insurance requirements. So talk to your agent and they can make sure you’re all good. Beyond that, like it or not, bad stuff happens. And if or when it does, you’ll be protected against at-fault damages, medical/legal issues, and a whole lot more. What Kind of Motorcycle Insurance Coverage Do I Need? Bodily injury liability: Helps cover financial costs for injuries to another from an accident where you were at-fault. Property damage liability: Helps cover the financial costs of repairing or replacing any damage you may have caused to someone else’s property. Collision: Helps cover the cost of repairing or replacing your bike if you happen to get a little too close to another object. Uninsured/Underinsured motorists: Protects you if you’re in a “not my fault accident” and the other driver has no insurance or not enough coverage. Medical: Protects you with compensation for medical bills from an injury that goes beyond your liability coverage. Comprehensive: Helps cover basically the "everything else that could happen besides an accident" category—like vandalism. Roadside assistance: Is a lot like having a really dependable friend you can call to come help If you end up stranded in the middle of nowhere during Bike Week. Rental reimbursement: Covers the cost of renting an alternate vehicle if your ride is out of commission for an extended period. Once an insurance company receives your application, they begin the evaluation process by looking at a few possible risk factors (like age, gender, location, etc.). Each of these risk factors has corresponding costs associated with it based on historical trends and current data. Next, they’ll check off the attributes and risk factors that apply to you, add them all up, add a dash of profit margin and—ding—your premium’s done. However, due to competition from other companies, they might even lower the price a bit—and who doesn’t love a good discount, huh? NOTE: Costs are subject to change. The insurance company may gradually increase your premium over time to keep up with the financial demands of offering the coverage. What Factors Influence the Cost of My Plan? Now, some of these factors bear heavier weight than others, but, in general, each is important in helping the insurance company understand what kind of risk insuring you would be. Someone who has a lower-end, less-envied brand of bike and who only uses it for leisurely rides through the countryside on weekends might only pay a few hundred dollars per year for coverage. Someone with a much fancier, $40,000 Harley who rides everywhere, even to get the mail in the afternoon, might pay thousands of dollars per year for their coverage. Comparing policy rates by yourself can be complicated—there's a lot of little tricky details to keep in mind. But our independent insurance agents have been through this many, many, many times, and they know the important things to consider when browsing coverage options. When it comes to getting you the best coverage, an agent can make your life ridiculously easy. Plus, since they're not tied down to one insurance company, they're free to shop, compare and assemble all the pieces of the coverage puzzle for you. And in the end, you always get what you want—the right coverage at the right price for you. We know what you want—quick and easy motorcycle insurance quotes in under a minute. Trust us, we get it. However, choosing maxed-out speed could mean sacrificing accuracy...which could end up costing you. Online companies might leave out options that'll save you some serious green, while conveniently leaving in factors that assume higher risk and calculate a pricier policy. Plus, our competitors might also sell your precious info to multiple companies, flooding your phone with unknown numbers and your mailbox with more junk. We've provided you with the info and options to connect with an independent insurance agent when the time is right for you. Can You Afford to Cover the Loan If Your Bike is Totaled?